Always the first full week in August, National Farmers Market week celebrates locally grown, farm-fresh produce. 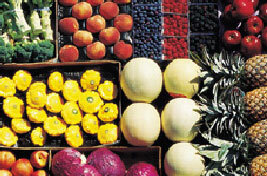 In Minnesota, summer provides the biggest bounty of in-season produce to enjoy from the farmers market. Now is a great time to stock up on fresh fruits and veggies, and take a few extra steps to store them for later in the year. Bell peppers will keep up to a week when enclosed in plastic and kept in the crisper. They are easy to freeze for later use—just chop them up and put in a freezer-safe bag. Cucumbers are highly perishable and should be enjoyed within a few days. Store clean, dry cucumbers in plastic and keep in the crisper of your refrigerator. If you’d like to save them for later, cukes are great pickled and fermented. Green beans are best if eaten within a few days. To keep them fresh, make sure they are dry, wrapped in plastic, and are kept in the fridge. To enjoy beans later in the year, trim them up, blanch in boiling water, submerge them in an ice bath, drain, dry and freeze in an airtight bag. Sweet corn gets less sweet and juicy over time—the day you get it is the day you should eat it fresh. If you want to keep it for a day or so, be sure to leave the husks on and store in the crisper. To freeze for later, strip off the husks and boil in salted water for a minute, drain, allow to cool and transfer to freezer-safe containers. Tomatoes are very perishable and generally last a few days at room temperature (they don’t like being in the fridge). There are lots of ways to store tomatoes, including freezing, dehydrating and canning. If you haven’t been to a farmers market yet this year, August is a great time to give one a try—you’ll stock up on produce and help your community.